Sir Michael Dummett, Wykeham Professor of Logic at Oxford from 1979 until 1992, was one of the most important philosophers of the English speaking world in the latter half of the 20th century. He converted to Catholicism at age 18 and remained religious. Throughout his career he fought against racism in the UK. He was also a world authority on voting procedures and pursued a passionate side interest in tarot cards. Michael Anthony Eardley Dummett was born in London in 1925 and schooled at Winchester College. In 1943 he won a history scholarship to Christ Church, Oxford, but went off to do war service in the Royal Artillery. He was received into the Catholic Church in 1944. After learning some written Japanese he was sent to India, where he translated intercepted Japanese wireless messages. After VJ Day, he was sent to Malaya, where, as he wrote later, "a passionate hatred of racism was first born in me". Dummett was demobilized in 1947 and went up to Christ Church. He read Philosophy, Politics, and Economics (PPE) and was "soon captivated by philosophy". He sat a new elective paper on the origins of modern epistemology, one text for which was Gottlob Frege's Grundlagen der Arithmetik, then newly translated into English. Much later, Dummett wrote of Frege's book, "I thought, and still think, that it was the most brilliant piece of philosophical writing of its length ever penned." After graduating with a First, Dummett took up a one-year post at the University of Birmingham. He sat the All Souls fellowship examination and was elected to the college, but continued to teach at Birmingham while rushing back to Oxford during term to pernoctate at All Souls. Once settled at All Souls, Dummett read all the published work of Frege, mostly in the original German editions, and visited the Frege archive in Münster to study the remains of the unpublished work. Prompted by his former tutor Elizabeth Anscombe at Somerville College, he also read newly translated and published books by Ludwig Wittgenstein. 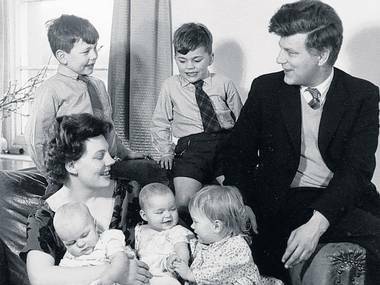 In 1951, Michael Dummett married Ann Chesney, a history graduate from Somerville. Fifty years later, he wrote of Ann, "she has been my constant support and delight throughout my life." Together they had five surviving children. Early in his All Souls fellowship, Dummett made a serious study of mathematics. In 1955 he was awarded a Harkness Fellowship to spend a year at the University of California in Berkeley studying logic and mathematics. He learnt from Leon Henkin, Raphael Robinson, John Myhill, Paul Halmos, and his later good friend Donald Davidson. While in Berkeley, Dummett became involved with the American civil rights movement. He noted later that "at that time the United States was the most racist country in the world after South Africa". He and Ann attended a rally by Dr Martin Luther King, whom he admired greatly, then travelled to Montgomery, Alabama, and met with Dr King personally. Dummett declined an offered faculty position at Berkeley. In 1959, Dummett published "Truth", a seminal work and his most important single paper. It contrasts what he later called realism and anti-realism and surveys various contexts in which the contrast arises. It cites mathematical intuitionism as a paradigm of anti-realism, but on a different basis from that of intuitionism's founder L.E.J. Brouwer. It even connects these ideas with Wittgenstein's later work. In a 1972 postscript he wrote, "I remain convinced ... that the issue between realism and anti-realism ... is one of the most fundamental of all the problems of philosophy." In 1962, Dummett became the Oxford University Reader in Philosophy of Mathematics. He held this post in conjunction with his All Souls fellowship, which continued until 1979. Between 1960 and 1966, Dummett regularly spent the summer quarter as a visiting professor at Stanford. For four years Dummett devoted every moment he could spare to fighting against racism. Both Michael and Ann Dummett were deeply committed both to organizational struggle within Britain and to work on behalf of threatened individuals. He played a key role in founding the Joint Council for the Welfare of Immigrants in 1967, chaired its founding meeting, and remained associated with the council for the rest of his life. During these years Dummett also succeeded in establishing mathematical logic at Oxford University. As a result, in 1966, a post of University Lecturer in Mathematical Logic and an undergraduate degree course in Mathematics and Philosophy were created. Dummett also secured the establishment of a Professorship in Mathematical Logic, to which Dana Scott was appointed. Dummett himself was elected a Fellow of the British Academy in 1968. In 1973, Dummett published his first book, Frege: Philosophy of Language, to enormous critical acclaim. The focus of his philosophical research was now much broader than philosophy of mathematics. In 1976, he gave the William James Lectures at Harvard, on the logical basis of metaphysics. The resulting book, The Logical Basis of Metaphysics, was finally published in 1991. His textbook Elements of Intuitionism, offering an advanced technical introduction to intuitionist mathematics and logic, was published in monograph form in 1977. In 1979, Dummett was elected to the Wykeham Professorship of Logic at New College. This slowed his writing but enabled him to supervise numerous graduate students, who were eager to study with him. He was awarded an Alexander von Humboldt-Stiftung Research Prize in 1982 and used it to work on his book Frege: Philosophy of Mathematics, which was published in 1991. In 1987, Dummett gave a set of lectures at the University of Bologna on analytical philosophy, which he described as arising from the idea that "a philosophical account of thought can be attained through a philosophical account of language" and indeed that "a comprehensive account can only be so attained". Dummett retired from Oxford in 1992. He gave the Gifford Lectures at St Andrews University in 1997 and the John Dewey Lectures at Columbia University in 2003. He won the Lakatos Prize for his book Frege: Philosophy of Mathematics in 1994 and the Rolf Schock Prize for Logic and Philosophy in 1995. He was knighted in 1999 and he was awarded the Lauener Prize in 2010. He died peacefully at home in late 2011. He is the subject of a volume in the Library of Living Philosophers. 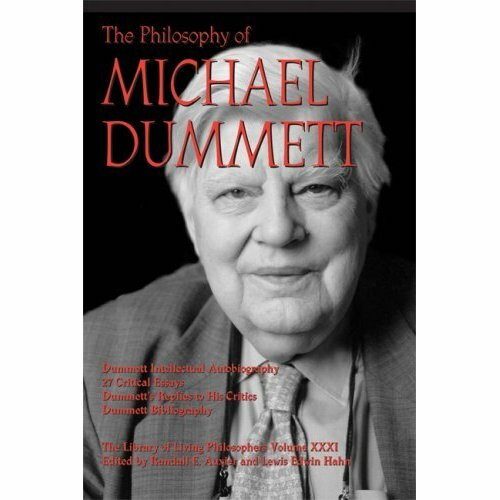 AR I was deeply impressed by Dummett's first book in 1973, attended his graduate classes in Oxford from 1975 to 1977, and stayed in contact with him up to 1980. His influence on my thoughts was huge and endures still. He was a very good philosopher. But I dispute that a philosophical account of thought can be attained through one of language. Language competence is only the tip of a neurological iceberg that embraces far more of the cerebral activity constitutive of thought than a philosophy of language can cover. All that submerged activity will one day have to feature somehow in a philosophy of thought.